But just because those granola blends aren’t the best, doesn’t meal all granola is off-limits. Now, as far as grain-based breakfasts go, I do think porridge is more wholesome than granola…porridge is cooked until soft so it’s easier to digest, it’s more hydrating and filling, and it usually contains less added sweetener. But sometimes you need a little crunch in the morning and there’s definitely a healthy way to make that happen. 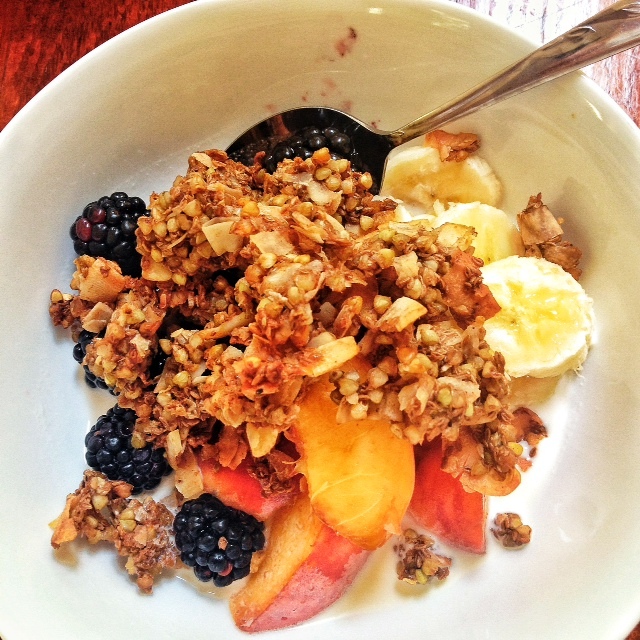 This granola is fruit-sweetened with an apple and dried dates. It’s made with buckwheat, a relative of rhubarb and sorrel, so it’s gluten-free and grain-free since buckwheat is technically a seed. 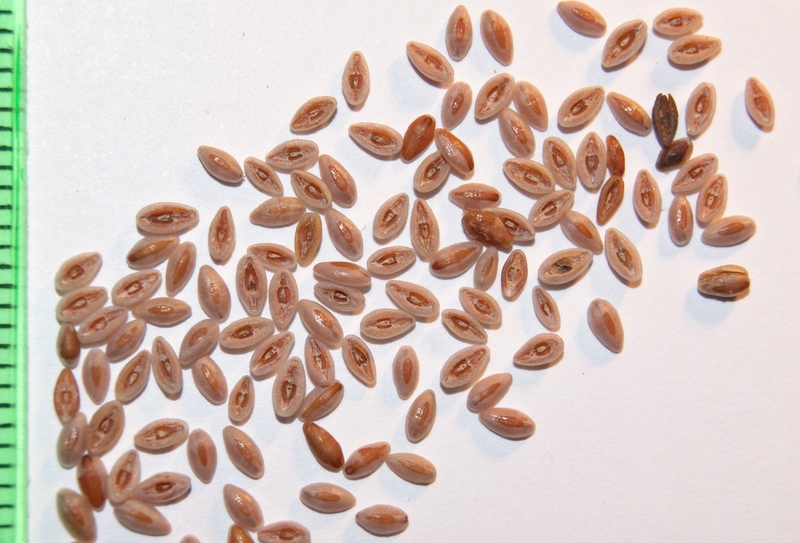 This recipe also calls for a good dose of psyllium seeds (pictured above) which are renowned for their fiber and a common ingredient in laxatives. Look for these in health food shops or order online. The buckwheat granola will need to soak at least 12 hours before baking and then dry out overnight, you’re looking at 2 nights and 1 day of (simple) advance prep before your buckwheat granola is ready. A wait well worth it. Drain the soaked buckwheat and rinse well several times to get all the gloop off. Allow to sit in a sieve at least an hour to drain excess water. Preheat oven to 300F. 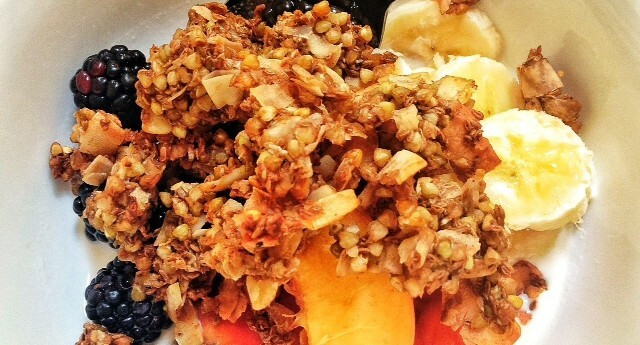 Spread granola mixture on a baking sheet lined with parchment. Bake for 1½ hours, stirring every 15 minutes. The granola, while still moist, will start to form clumps…your choice if you want to break these apart. After this period of baking time, the granola will still be relatively soft but will have started to brown and emit a nutty aroma. Turn off the oven and leave the granola in the oven until the next morning (make sure no one turns it on and burns your granola during this time!). Store the granola in an airtight container at room temperature for up to 1 week. At this point you could stir in some dried fruit. I wait until after the granola has baked to do this so the dried fruit won’t turn into leather.